As we reported earlier, Royal Mail's Post and Go machines made another trip to the far east at the 31st Asian International Stamp Exhibition in Hong Kong. It was the perfect opportunity to produce a new roll with the Hong Kong Sea Travel stamp solo, which Royal Mail duly did, utilizing the new digital printing process for this short run. The (gravure printed) Union Flag stamps would also be available, on the first occasion that the national code HK would be used. Digital printing of Post and Go stamps has previously been confined to stamps produced for Qatar and Gibraltar, but this is the first for Royal Mail: it won't be the last. Royal Mail initially announced that 'GB' versions would be available from Tallents House Edinburgh. When dealers tried to order they were told that no GB versions would be available, and then a couple of days later were sent an order form, and the stamps also appeared on Royal Mail's shop website. 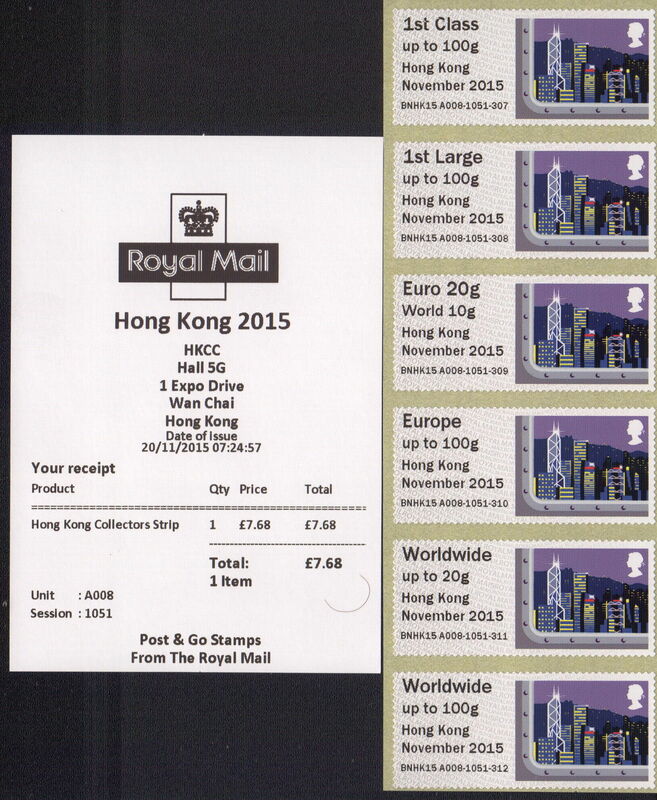 Only 12 rolls of the new stamps were taken to Hong Kong, and there were long queues at both machines (A008 and A009) with the familiar faces appearing to buy quantities of collectors sets and 1st class strips. These have duly appeared online at various prices. Understandably there was less interest in the home-produced GB versions, despite the Hong Kong stamp being a new printing. However, those who did order early were in for a surprise. Whilst the Union Flag strip was normal, with a receipt for £7.68, the Hong Kong strip had different 'values' or Service Indicators, and a receipt for only £6.12 (although £7.68 was charged by Royal Mail's shop). The Service Indicators of Local Standard, UK Letter 20g and 30g, EU and Worldwide 20g were odd but the final stamp is the clincher - 'Registered Fee' shows this to be almost the same set as appeared at Europhilex from the Royal Gibraltar Post machine, the difference being that the Europhilex strips had a UK 40g Letter stamp, whilst this has a UK 30g stamp! So yet another in the long series of errors on Post and Go stamps. Royal Mail has recently moved Post and Go product and pre-order printing to Tallents House. In other words, they are no longer relying on a contractor to print the stamps for sale. After a series of errors of inscription at live machines, notably at Stampex on several occasions, the idea that the stamps produced from the back-office machine B001 would be produced in house was welcomed. After all, Royal Mail would be in control, and - presumably - have more control, or at least check what was being produced in house. 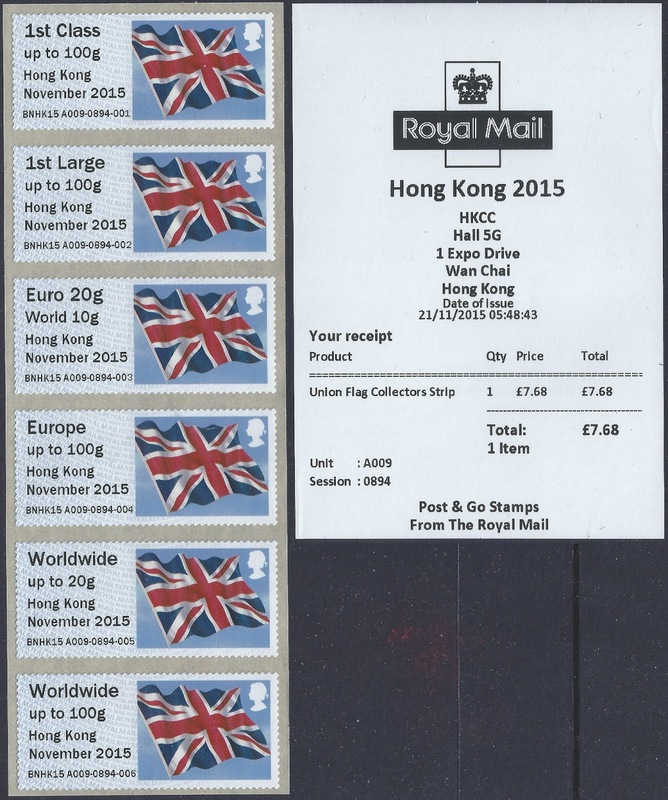 Whichever stamps were produced first, Union Flag or Hong Kong, one would expect that they would be inspected for quality of printing, both in intensity and registration. Perhaps it was just a case of looking at the wood without noticing that the trees were different? In carpentry the saying is 'measure twice, cut once': I'm sure there could be a similar maxim applied here: look at how good they are, and whether they are of saleable/ collectable quality, and then look again harder to make sure they are exactly what you expected to produce. And have more than one pair of eyes looking! Inevitably some customers contacted Tallents House to complain that they had been charged £7.68 but had a receipt for only £6.12 - without realising that they actually had a collectable error. Royal Mail thus alerted, I understand that the remaining stock was immediately removed from sale, leaving those of us who ordered later likely to get a new printing of the stamps with the correct UK Service Indicators. My thanks to the several collectors who sent pictures and reported what they had received. Just for the record this (above right) is what the stamps from the exhibition looked like, with UK Service Indicators from machine A008 (click on the image to see it larger). The only one of the error strips I have seen on the eBay auction site, item 381478639269 sold yesterday for £220. By chance I am also able to show the box label for these Hong Kong Coils - ignore the datestamp as this relates to when something else was despatched to me from Tallents House using the P&G box. The web page for the Union flag is indicating that this too is a ‘digital’ printing! There was also mention of Gibraltar’s GI04 being at the exhibition, which didn’t materialise. Which goes to show that I shouldn't write any more about what Gibraltar are doing because there is no reliable information, ie from the RGPO. There is no reason at all for the Union Flag to be a digital printing and I don't think it is. I ordered various Post & Go issues recently and paid for them only to get an email on Thursday 26th November refunding my payment. No explanation as to why they could not supply my stamps, nothing. Very poor customer service. I had an email refunding part of my payment after I phoned to change the (apparent default) delivery address from USA (I had sent direct to a customer) to my own. But no cancellation - yet. As the statement about Gibraltar attending Hong Kong was included in the Royal Mail release, we should have been able to give credence to the information. Perhaps a late change in plans led to the Gibraltar rates being on the back office system, bit no Gibraltar sock being available, staff being unfamiliar with what was being issued mistook the Hong Kong skyline labels as those for Gibraltar. It does raise the question does Tallents House now produce the bureau stock for Gibraltar, Guernsey & Jersey? If so this error may not be the only time it happens. Given that Royal Mail have proved time and again that they can’t get the back office issues correct, shouldn’t they now desist in producing these issues, they don’t replace those issued to customers from the machines at exhibitions, they add to the list of what people will buy. I suppose it comes down to revenue or reputation, it seems clear which they’ve gone for. I'm not convinced, John. Maybe it's the cynic in me, but it would not surprise me to know that there are back office machines in Edinburgh, St Helier, St Peter Port and Gibraltar ALL numbered B001. Although the Post & Go overprints are now in house I am not sure they follow exactly the same track as the stamp issues which may be part of the problem. I also get the impression that some of the overprints decision are relatively late almost last minute compared with stamp issues. We know the stamp issues for next year although subject to refinement including the basic Post & Go issues. We know nothing about Post & Go overprint issues for next year although we can guess at STAMPEX x 2 & Scottish Congress. In 2015 we were lucky to get 1 month's notice on other issues and I can't help thinking this is part of the problem at Royal Mail - too much is done at the last minute. The IAR kiosk page is pretty accurate even listing the Qatar m/cs. I seem to recall you pointing out there was no m/c in Guernsey at one point. Have the local staff the skills to programme the m/cs? (IAR could of course visit as the do with the Museum m/cs I think). At none of the events I have visted have any of the 3 countries had representatives with their m/cs, only IAR staff. Needs someone to chat to IAR but we won't see them until STAMPEX 2016! The plot thickens. I have just seen a scan of a strip from Gibraltar House dated 7 September which has a UK 30g and receipt cost of £6.12 and it seems to be this which has repeated on the HK strio. The collector thought it was a printing error but it could be a deliberate change. The Gib House strips are GI01 whereas HK is B001 On Ebay the Gib House Trafalgar oprints have yet a different range of service values (no registered). 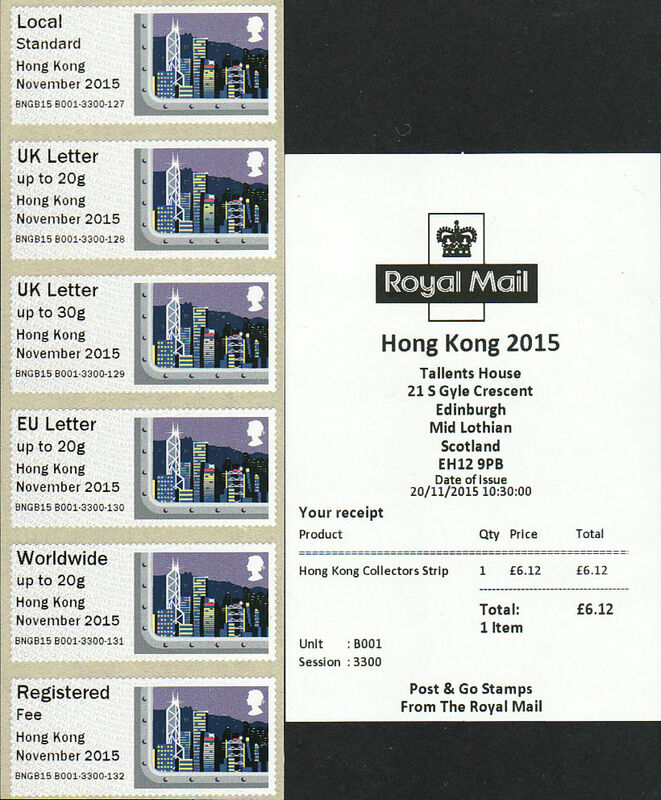 It would seem that the values were deliberately changed and somehow the software for that issue was used for the HK TH stamps.